April 3, 2018 at 10:52p.m. Photo by Vindicator file photo | Youngstown State’s Indiya Benjamin dribbles up the court during a game against Green Bay in February. There was the slow start. There were injury concerns both before and during the season and a lot of youth getting major minutes, but the Youngstown State women’s basketball team put together a decent season. The Penguins (16-16, 11-7 in the Horizon League) earned a postseason appearance — a one-and-done in the Women’s Basketball Invitational — for the third time in five years under coach John Barnes. It’s the second-best stretch in program history, behind Ed DiGregorio’s three NCAA tournament appearances in six seasons. 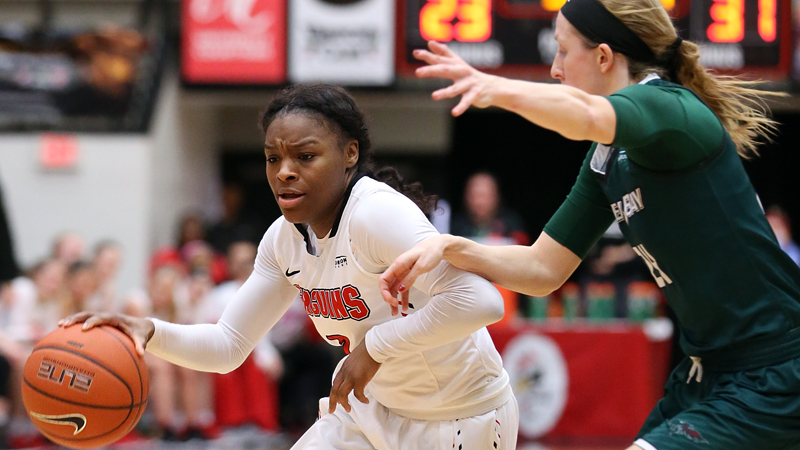 The WBI bid came after YSU rebounded from a 6-12 start to finish as a Horizon League semifinalist, falling to eventual champ Green Bay, 62-49. “I thought we dug in. The players really dug in deep. They started practicing harder. They started playing harder. Our level of toughness raised up some and it was hard to play with confidence when you weren’t winning games,” Barnes said following the team’s loss to Binghamton in the WBI. The past season was a huge improvement over last year’s 9-21 campaign, which was marred by season-ending injuries to Sarah Cash and Nikki Arbanas. With the pair returning with surgically repaired knees this season, they held up well. Cash averaged 21 minutes and a team-best 11.6. Arbanas was the team’s best 3-point shooter, shooting 39 percent on a team-high 166 attempts. Both players missed just one game each. The Penguins still took some lumps. Junior guard Alison Smolinski was limited to 16 games with a broken foot and senior guard Kelley Wright broke her arm in the team’s regular-season finale. Three freshmen — Chelsea Olson, McKenah Peters and Anne Secrest — averaged at least 10 minutes this season. Olson was the most productive. She was the Horizon League’s Freshman of the Week four consecutive weeks as she didn’t take long to lock up a starting role, She averaged 7.9 points and 4.3 rebounds. YSU will lose three players to graduation — starting point guard Indiya Benjamin, reserve forward Morgan Olson and Wright. Secrest announced after the season that she is transferring to Division II Indiana Wesleyan. Tuesday, Arbanas posted on Twitter that she “will forego my 5th year of basketball eligibility” so she can attend Palmer College of Chiropractic in Iowa. Benjamin departs Youngstown as one of the best players the program has had. She holds the career records for assists and games played. She was the nation’s only player in any division to have at least 600 assists and 200 3-pointers in her career. The outlook for the Penguins next year is similar to the previous year. Even though YSU dealt with injuries to key contributors, it sets up a situation where today’s players in emergency roles are tomorrow’s key pieces. “I think with last year with a lot of injuries and having only nine wins and to have injuries this year and get 16 wins with all these young players getting minutes, it’s really exciting for the future,” Barnes said. September 26, 2017 12:09 a.m.
October 14, 2016 12:05 a.m.